This web site is now dormant, Holker Old Boys AFC will advise the new location shortly. This site will remain as a record of the period 2004 – 07 where Mr. S. Livingstone was Club Chairman. We would like to wish the club future success and look forward to the results on the pitch continuing to improve as the full force of Holker Junior Football moves into the Senior set up. Congratulations to ex Holker star Wayne Curtis, as he plays his part in Morecambe FC’s win at Wembley to secure a place, for the first ever time, in the Football League. Holker have developed a great relationship with Morecambe as they too view youth as an important part of any clubs success. Thanks went to all the Committee, to Jonny Maxfield & Sam Turner for the care of the pitches, including a special award from the Junior Section, & to all who made sure that season 06/07 was not the disaster first envisaged. So Holker finish the season with a home win, coming from 2-0 down to defeat Norton United for the 3rd time this season, goals coming from Low, Keenan & Southward. How apt that the youngster, the guy who came to give North West Counties football a go and the ‘old timer’ who returned to the club early season all scored. This typifies what Holker are striving for, good experienced players WHO can deliver at this level, Sooty again bagged 15 goals (finishing 12th in the list this season), the good young player who wants to have a go at it, Danny Keenan came from Barrow Wanderers; struggled a little at the start, spent a few months in the Reserves came back in & has looked to be developing nicely now & also Chris Low who represents what Holker must be for the next few years, good young talent playing first team football for the club, not themselves. Chris came through our highly successful juniors, as did at least 9 others who have been involved with the first team this year. At the start of this season we had the ‘Holker Exodus’ headlines, the doom & gloom of people within local football that Holker where to implode. However those who understood football knew there was only two ways to go, pay to attract players or build on the youth we had coming through. One leads to bankruptcy & the other leads to an assured future, no club has a better junior set up than Holker, so lets give it a chance to develop our future. One statement that was used was ‘Lets play the kids, we cannot be any worse…’, so at the season end how did we do? The buzz around the club has not been better for a number of years, we get regular e-mails from supporters of other clubs congratulating us on our style & standard of football, we progressed in cup competitions, including knocking promoted Runcorn Linnetts out of the KO Cup, we won the Lancashire Youth cup with OUR juniors & players (only Jon McMenemey did not play senior for us, but was developed through our junior), we paid our bills and we finished a creditable 14th in the League, oh & last year we finished 15th, so we were right ‘Lets play the kids, we cannot be any worse…’, we travelled over 2,000 miles for the experience and just as importantly we have other good young players wanting to give the higher level a go next season and some senior players, potentially not being paid next year, expressing an interest. We also have had an average crowd of 44 (798th best supported team in the country), not many compared to the 700 at the Soccer, but what is important is they enjoy their Saturday afternoons with us; they enjoy the football & a pie & a pint watching local Barrow developed lads give the game their all. So to us at Holker, we have enjoyed the season, we also want to improve, so good players or managers (we required a Reserve Team Manager) who want to get involved in Barrow’s only FA Chartered Club, please contact the club either directly or via this web site & to potential sponsors, think about the exposure, look at the coverage in the national press our sponsor Schofield Construction received from Graham Capstick’s 60 yard headed goal. We’d like a run in the FA Cup & the Vase and some ‘Senior’ silverware would be nice, so yes we also want to be better. So from this web site, thanks to all at the club for an enjoyable season, especially the Under 18's who have matured rapidly this year. Enjoy the summer, you can see most of our lads playing cricket in the Northern League for Barrow CC and see you back at Rakesmoor in August (for the players I believe that is June when a good old fashion ‘hard’ pre season is planned!). For league details see the NWCFL web site. Thank you for your hospitality on Tuesday, you are definitely one of the friendlier and more hospitable clubs to visit. The food was lovely and greatly appreciated on a wet Tuesday with a long drive home. Thank you to your team for a good game of football. I apologise again for the rowdiness as you probably appreciated, finally having confirmation of promotion means a lot to the players and the club after the experience of the previous near misses. I shall miss visiting you next season, as a North Yorkshire lass it is a treat to have an extra excuse to travel North and hear some familiar speech. I wish you all the very best for next season "
Good luck to Winsford & thanks for the appreciation. Holker Old Boys U-18 lifted the Furness Building Society sponsored Lancashire U-18 Cup at Leyland on Tuesday with a 1-0 victory over Akzo Nobel. The goal coming in the 75th minute with a 30-yard left foot strike from Chris Low that would have graced any Final anywhere. Akzo were a well organised side who started the stronger, hitting the bar early in the game, however Callum Livingstone had a goal wiped out for 'apparent' offside in the 20th minute. Holker only started to play in the last ten minutes of the first half, but efforts from Tod Bamber held out hope. The second half saw the game come to life with Holker looking dangerous but Akzo played well on the counter attack with Holker keeper Stephens have to be alert & making a couple of good stops. The Man of the Match, awarded by FBS CEO, Rob Cairns, went to Holker left back Gareth Smith. The majority of these lads now leave junior football as LANCASHIRE Champions! See Lanc. Champs. page for more details. For all fixtures check Fridays Evening Mail. For all Furness Premier League information access their web site. ALL JUNIOR FIXTURES CAN BE SEEN IN TUESDAY’s JUNIOR MAIL & FRIDAYS Evening Mail OR FROM THE TEAMS COACH. 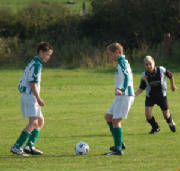 Girls Football - Holker Old Boys AFC are recruiting U11 players (school years 5 & 6) to establish a team. Any girls of this age interested in playing football should contact Adam & Natalie Kendall on 01229 812919 for more information. Holker Old Boys are Barrow's only FA Chartered Club, this gives parents 'piece of mind'; training takes place at Holker's Rakesmoor Lane each Sunday, contact the club's e-mail address for details. JUNIOR NEWS.... - Are you a Year 1 or a Parent of a year 1, want your child to start football, come along to Barrow's only FA Charter Club coaching from April 17th will be on Tuesday evenings from 6 pm until 7 pm. on the bottom pitch at Holker's Rakesmoor Lane facilites. This is how the majority of our 170 junior players started. All coaching done by FA approved coaches with Child Protection awareness (for our policies see our Charter Standard Information page). JUNIOR TEAMS – Want details of Junior training then any young players not at a club or any parents who want their kids at the towns only FA charted club, please contact Holker via the e-mail address to find out training time etc. To find out what being FA chartered is all about use the attached link thefa Charter Standard Clubs . A few of the ‘Holker Faithful’ who have supported each Saturday at Rakesmoor Lane this season. Most of these guys have turned up & supported us each Saturday for a few years now. They pay their £2 admission, buy a programme for a £1 & have a couple of pints in the club. 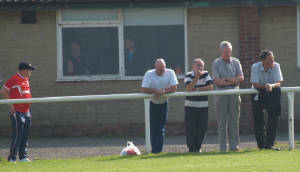 They listen for the Barrow score & enjoy watching Holker. 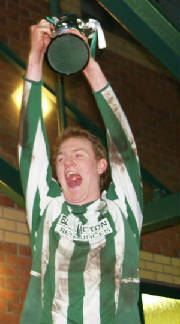 From Holker Old Boys, thanks to each one of you, we appreciate your support this season & hope you'll be back in August.